The following is a true story. It was told to me at knit night on Wednesday. I will do my best to recount the story as it was told to me. Names have been changed. It was a February evening in southern Minnesota. A monthly hand-spinners get-together was just breaking up, spilling its chattering crowd, like a tumbled basket of yarn, into the snowy streets. Anne clutched her nearly finished blue cardigan to her chest as she strode toward her car, fumbling for her keys. “Almost done,” she thought. “If I’d just had a another hour I could have bound off the second sleeve and woven in the ends. Oh well, no matter. I’ll finish it tomorrow.” She trudged to the passenger side of her white sedan and plopped the project and the remains of her last ball of yarn onto the seat. She closed the door, then rounded the car and settled into the driver’s seat. The car engine protested the cold as she turned the key in the ignition, but gamely turned over on the second try. Flipping on her head lights, she pulled out onto the snowy street and began to drive away. Sally was among the last of the guests to leave. She was a warm and talkative women, not content to depart until she’d said her goodbyes to all of her fellow spinners and helped the hostess to gather stray plates and mugs. She was just walking out the front door, pulling on her coat, and she saw Anne’s car pulling away from the curb and driving slowly away. She noticed something odd about the car that made her take a closer look. Something was trailing behind it: something small and blue that bounced gaily behind the car on the hard-packed snow. A balloon? No. A ball of yarn! The car was already a block away, stopped at a stop sign, when Sally began to give chase. She tried valiantly to flag Anne’s car down, stumbling toward it in the snow. “Stop,” she cried, waving frantically. “Stop!” Her cries were to no avail. Anne’s car pulled forward through the intersection and continued on its way, driving straight for another block, then turning left and out of sight. Sally trotted along in the snow, eyes fixed on the yarn, searching for the ends. The yarn had stopped moving, so perhaps it had reached the end of its supply. Still cradling the ball of yarn, Sally blew on her hands to warm them. When some feeling had returned, she reached into her pocket to grasp her car keys, then walked over to her little yellow sedan and started the engine. 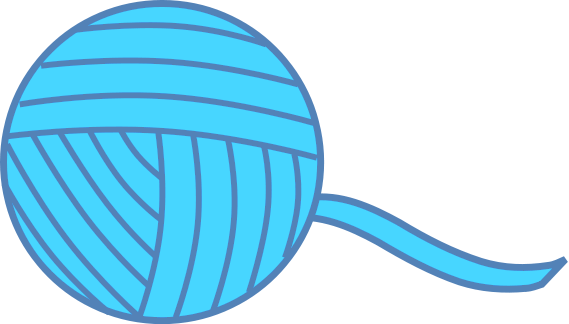 Once the heater had warmed up and was blasting away, she rolled down the driver side window and threaded the yarn through it. Then, steering the car with her right hand and holding the ball aloft with her left hand, she pulled out onto the street. Creeping along the sleepy suburban street at stuttering pace, Sally carefully resumed winding the ball. Pull forward a few feet, then wind. Pull forward another few feet, wind some more. “Two blocks worth of yarn is a lot of yarn,” she thought. “What must the neighbors think ?” Sally wondered idly, after a few minutes. “There’s this little yellow car moving very slowly down our street, driving kind of erratically. Is this person on drugs? Are they casing the neighborhood? Are they looking for the gun they dropped in a robbery?” She hunkered into her seat and wound faster. “Just like the bad guys from Home Alone,” Sally thought. Twenty minutes later, no police had arrived to question her and she had finally finished winding the ball. She held it in her hand and tossed it up and down. It was hefty and almost too large for her to palm properly. A full hank of yarn, easily. Sally rolled up her window and pulled over to the side of the street. She fished her cell phone out of her pocket and dialed Anne’s number. It has been energy sappingly warm in my neck of the woods this week so I have no updates. Such a delightful tale that I simply had to share! Such a lovely story ! Oh my goodness, what a wonderful story! but what knitter wouldn’t do this?? Especially if you KNOW it’s their last ball of yarn for a project they’re working on. They may never be able to find that dye lot again! I would do it. I did do it! The temperature was frigid, and the wind was far worse. My name is actually Patty, (Patty-Joy on Ravelry). The adventure didn’t end with the turning over of the rescued blue yarn at the in-between point of a KwikTrip gas station that night, but rather continued as I made my way home. I had to do a radical swerve to avoid hitting a dead deer smack-on in my lane. I pulled over in a cemetery and called 911. I wanted a cop to come pull the deer out of the lane so no one else would hit it…and because to be honest, I was Way. Too. COLD to do any more good Samaritan deeds and pull the deer off the road myself that night, (if that were even possible, which I tend to think it is not). The 911 dispatcher was distraught because I could only give her the name of the road and two (extremely well-known) landmarks, but not a cross-street name. There wasn’t a cross-street as I was headed out of town to my country home, but I was thinking, “Honestly, lady… If you’ll just send a deputy out here and tell him that the deer is in the eastbound lane RIGHT WHERE IT GOES FROM FOUR LANES TO TWO, (duhhhh! ), I know he’ll be able to find it. Lady, paleeease, will you just give him a call and let him figure it out? I am FREEZING sitting here in the entrance to a cemetery, and I just wanna hang up with you and GO HOME NOW!! !” Yup, it was a long night. But you wanna hear the real happy ending? My blue yarn friend, who by the way, has in the past generously given me some of her luscious hand-spun yarn, showed up at Wednesday night knit night, (yes, that’s two consecutive knit nights! ), with a luscious new skein of Malabrigo sock yarn in my favorite colorway, and handed it to me, while she did a spin, wearing her now-finished beautiful blue sweater. True knitterly friends will do everything possible to see the smile of another knitterly friend accepting a gift of yarn. I’m off to design some luscious socks to knit with my gift yarn, which is safely tucked deep down into my spacious traveling knitting satchel. All is right with the world! Totally nuts. 🙂 We love her for it. Everybody I’ve told this story to (who knows her) says they can totally see her doing that. OMG!!! What a sweet heart! Bless her heart! What a wonderful friend!